Product information "Temperature & Humidity Sensor"
With the Temperature & Humidity Sensor you can easily increase the comfort of living in your home: The sensor reliably measures temperature and humidity and lets you know when it's time for fresh air or when the heating should start heating. The device is a 2 in 1 sensor that uses a barred opening to measure the humidity and temperature of its surroundings - effectively protecting it against hazards such as fire or mold. The sensor is small, inconspicuous and can be attached horizontally or vertically to any surface. In addition, it has tamper protection if it is moved without authorization. 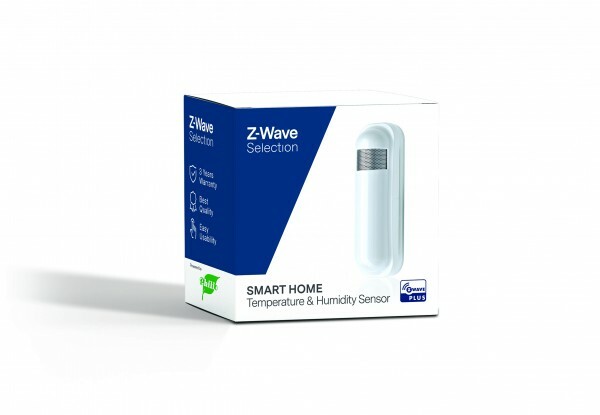 Via Z-Wave, the information from the sensor is forwarded to a gateway. With this small sensor you achieve more living comfort in your home: Through ideal temperature and humidity as well as reliable protection against stale air or mold. Related links to "Temperature & Humidity Sensor"